The Egyptian Football Association (EFA) is likely to cancel this season’s suspended Premier League in a move designed to prevent further violence in the wake of this month’s riot in Port Said that left 74 militant soccer fans dead but threatens to put the country’s clubs in financial jeopardy. Concern that the league will be annuled has been fuelled by the cancellation of the Egyptian national team’s scheduled friendly matches against Uganda, Guinea and Niger and the postponement until June 30 of an African Cup of Nations qualifier against the Central African Republic on instructions of the interior ministry. Once new dates have been agreed, the qualifier may be played in Qatar to ensure security. The decision on the national team’s matches suggests that the interior ministry and the EFA have backed away from an earlier plan to allow resumption of league matches behind closed door on March 15 when the 40-day period of mourning for the dead soccer fans ends. Club officials are pressing the EFA to follow the example of the Tunisian soccer association that earlier this month ordered its league to play behind closed doors. The federation reversed its decision days later under pressure from its members and has since authorized resumption with fans attending matches. 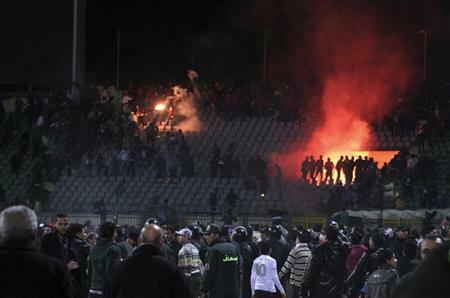 Some argue that cancellation of the Egyptian league would hand a victory to the instigators of the Port Said incident. "The Interior Ministry's letter, which demanded that Egypt's friendly games be cancelled, came as a killer punch to our plans to resume the competition. We have no option but to follow the instructions of the authorities. We will wait to see whether security will improve. I hope the authorities will reverse that decision soon, because cancelling the league will have dire consequences on Egyptian football on all fronts,” said acting EFA president Anwar Saleh in an interview with state-owned newspaper Al Ahram. The fate of the Premier League season has been hanging in the balance since early this month when 74 people, mostly militant fans of crowned Cairo club Al Ahly SC, were killed in a riot immediately after a match against Port Said’s Al Masry SC. The fans or ultras – well-organized, highly politicized, street battle hardened militant groups modelled on similar organizations in Serbia and Italy – believe that security forces failed to intervene in the brawl as punishment for their key role in last year’s overthrow of President Hosni Mubarak and their hard line opposition since then to military rule. Ultras battled security forces on a weekly basis during the soccer season in the last four years of Mr. Mubarak’s rule in a bid to deprive his regime from controlling the beautiful game. An Egyptian parliamentary inquiry into the deaths in Port Said blamed fans and lax security for the worst incident in the country’s sports history. The inquiry’s preliminary report also suggested that unidentified thugs had been involved in the violence. Egyptian judicial sources said they expected that security officials would be among 50 suspects who will be referred for criminal proceedings in connection with the incident. Several key Al Ahly players, including Mohamed Abou Treika, Mohamed Barakat, Ahmed Fathi and Emad Mete'b, have said they will not play until the results of the official investigation are announced. Some players favour cancellation of this season’s league despite the financial risk to clubs on the grounds that the risk of renewed violence is too high and that they won’t have sufficient time to recover from the trauma of the Port Said incident and to prepare for matches. "It's impossible to resume the Premier League this season, because there won’t be time to clear the backlog of matches. I’m not against the resumption of sports activities after the end of the mourning period, but resuming the Premier League will only cause more chaos,” said Al Ahly goalkeeper Ahmed Naggi. Egyptian clubs as well as the fans fear that the clubs which last year suffered financially because of a three-month suspension of the league in the walk-up to and aftermath of Mr. Mubarak’s downfall could be bankrupted by a cancellation of the leagues. The clubs which have yet to be professionally restructured so that they can become truly financially independent are currently dependent for their revenues on advertising and sponsorship. The Mubarak regime, which saw soccer as a tool to shore up its tarnished image, distract attention from unpopular policies and a means to manipulate national emotions, had little interest in allowing clubs to be independent, self-sufficient entities. In an alliance of strange bedfellows critics of the interior ministry’s apparent intention to cancel the league include both clubs owned by the police and the military as well as Al Ahly which sees the cancellation as handing victory to the security forces whom it holds responsible for the deaths of its supporters . "Life must go on, despite this catastrophe. But I don’t mean that resuming the Premier League means forgetting the victims of Port Said. Rescinding the League will cause Egyptian clubs many technical and financial problems. Resuming the League is something urgent for all the workers in local sports associations,” Helmi Toulan, coach of Ittihad al-Shorta, the Premier League team owned by the police, whom many Egyptians despise as the enforcers of Mr. Mubarak’s regime and hold responsible for the Port Said incident, told Melody Sports TV. Underlying the debate about the fate of the league and the political implications of the Port Said incident is the growing gap between Egyptian public opinion and the youth and soccer fan groups that were at the core of last year’s protests that toppled Mr. Mubarak. A majority of Egyptians eager to see their almost bankrupt country return to normalcy and economic growth have come to see the youth and soccer fan protests in support of an end to military rule and the dismantling of the Mubarak order that often escalate into vicious street battles with security forces as an obstacle. “Our young people would not have reached this feeling of desperation, if they had not been abandoned by others, who, a year ago joined them in celebrating the toppling of the Mubarak regime. Although they shared the same aspiration that this moment would be the start of building a free, democratic and progressive country, the majority of the Egyptians seem not to have the strong will and persistence to continue the momentum until their dream comes true. It is only those youthful enthusiasts that launched this revolution, who were eager to continue their efforts to fulfil its goals Instead of appreciating their exertions and the great sacrifice they have continued to pay for the welfare of the whole nation, we have allowed some malicious campaigns to distort their image and depict them as thugs some of the time and rioters most of the time. What is even worse is to accept the accusations being directed to them as agents of some foreign powers seeking the downfall of Egypt and its divisions into small states, without thinking of the price young Egyptians might pay in confronting the military or civil police. They are subjecting themselves to the risk of death or serious injuries that might disable them for the rest of their life,” said Manal Abdul Aziz writing in The Egyptian Gazette. Whether used by leaders to shore up support in a moment of victory, or "revolutionaries" to state their case in a moment of tragedy, politics do not belong in sports. A perpetual state of abnormality is as unhealthy as it is unsustainable.